We’ve been talking about Amazon’s “Mechanical Turk” as a means of making extra income since it was launched in 2005, and we’ve heard from many people who are “Turking” for money with great success. We even tried it a decade ago to see what it was all about before sharing it with others. Well, 11 years later, I wanted to dip a toe in the Turk pool myself to see just how the site is to navigate, what types of HITS (Human Intelligence Tasks) are listed, and how much they are paying now. For those who are new to Amazon Mechanical Turk, it’s a crowdsourcing marketplace that enables “Requesters” (individuals, organizations, universities, businesses, etc.) to find “Turkers” (workers – YOU) to complete HITS (jobs) of various types and sizes. One of the great things about Turking is that you can cash out with as little as $1 in your account – paid directly to your Amazon Payments (similar to PayPal) account. From there, you can transfer directly to your bank account. So, if you need money quick, you can log on, do some quick HITS and cash out right away. Tip: If you are a new Worker, there is an initial 10-day holding period before your money is transferred to your earnings balance. SO, sign up and do a task quickly to get the 10-day clock started. There is no correct answer to this question. We’ve heard from people who make a few dollars a week, and others who make hundreds a day. It depends on how much time you spend at it and what types of tasks you’re doing. Another task, paying $0.05 involves watching a very short surveillance video and clicking a button every time you see a person crossing a red line on the video. These types of small tasks don’t pay much but they do add up! Higher paying HITS are often transcription-related (Speechpad uses MTurk to find transcribers) and can pay as much as $200 for longer audio recordings. So, while the amount might be attractive, it’s important to remember that transcribing 6 hours of audio can be quite time-consuming. Tip: When I registered, I looked at the available HITS and sorted the “Reward Amount” by “Reward Amount (most first)” so that I could see the top-paying HITS first. The highest paying HITs were transcription gigs and that is NOT my thing. I am a seriously slow and not-that-accurate typist. So, I scrolled past those and found a HIT that read, “New Englanders: read and record 12 short sentences,” and the reward was $4.00. I’m a Connecticut girl, so this one was perfect for me! I accepted the HIT, recorded myself reading the 12 short sentences, and submitted them to the Requester. It was a quick and easy $4. A nice bonus for those of you with a “little” household chaos – whether in the form of kids, pets, spouses, or even a home-based job – is that many of the HITS can be “put down” for a bit when you have to (or choose to) deal with other things for a while. In a nutshell, Turking is what you make of it. It’s worth signing up and taking some time to search through the available HITs. Set aside some time to go through the list to really get a bead on the types of jobs listed – they’re very diverse and you’re certain to find some you wouldn’t have expected. Once you’re more familiar with the listings, you can use the search box at the top of the page to look for things you are interested in. Click here to visit Amazons Mechanical Turk and start your own Turking story. 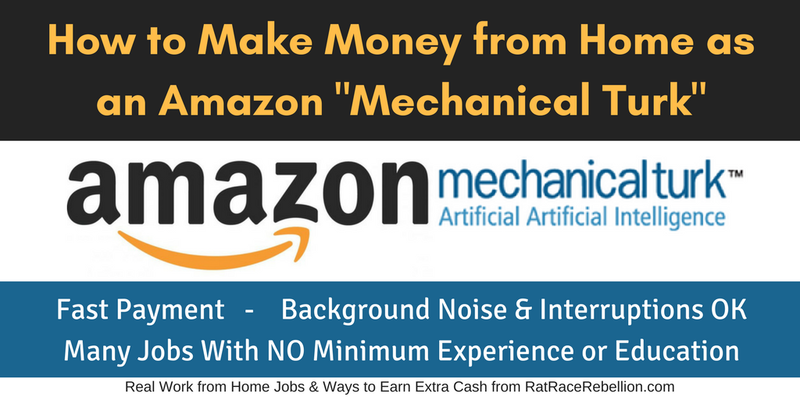 This entry was posted in Earn Extra Cash, Hiring Companies, Independent Contractors, Work at Home Jobs and tagged Amazon, Mechanical Turk, Turk. Bookmark the permalink.